From the 21st to 26th of March, the Swiss city of Basel came alive once more for the annual Baselworld Watch and Jewellery Show. With 520 exhibitors, Baselworld 2019 featured brand-new releases from world-renowned brands that delighted the 81,200 visitors in attendance. Horology trends are constantly changing, and this event is perfect to showcase all the innovations that are transforming the industry. Just like with previous Baselworld shows, we love seeing all the timepieces announced during the six-day watch-and-jewellery extravaganza – and can’t help but play favourites. Below, you can find our top picks for this year’s Baselworld, which we’re confident you’ll be just as passionate about as we are. Since its inception in 1884 by Léon Breitling in Saint-Imier, Breitling have established themselves as a brand with a global reputation for precision watches and pioneering designs. Its association with the world of aviation and diving, as well as its commitment to excellence, have truly allowed the watchmaker to stand out in the industry and become a sought-after brand by many across the globe. Breitling has also been featured in pop culture, for instance in the 1965 James Bond film Thunderball, which saw 007 wearing a Breitling Top Time with a Geiger counter. This timepiece was found in a car boot sale in England in 2012 after its disappearance. Limited to only 1959 watches worldwide, the Navitimer Ref. 806 1959 Edition celebrates one of the most iconic designs in the range, a game-changing chronograph that became a staple in every cockpit as soon as it was released. The piece has allowed pilots to make critical flight calculations while in the air, mainly due to its innovative circular slide rule. In addition, the manual hand-wound movement is a COSC-certified chronometer encased in stainless steel and is water-resistant up to 30 meters. Perfect for the gent who appreciates sophistication and heritage and has an adventurous spirit. 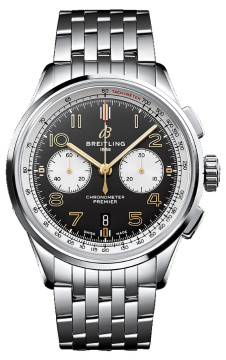 Breitling is known for partnering with some of the world’s most prestigious brands and the Premier B01 Chronograph 43mm Norton Edition watch (image) arose from their relationship with the fantastic Norton Motorcycles. The epitome of high-performance engineering and stylish design, this piece is both innovative yet timeless, featuring a black dial with golden Arabic numerals and hour and minute hands – coated with Super-LumiNova® – which are highly visible while riding a bike. The stainless-steel bracelet is sturdy and ideal for even the most demanding of environments, especially accompanied by a power reserve of around 70 hours. The chronometer with Calibre 01 can be seen through the transparent sapphire caseback. Another fantastic Breitling piece, the Premier B01 Bentley Centenary Limited-Edition watch further showcases what makes the Swiss brand so special. The unique brown burl elm dial is the perfect addition to an already stylish watch, particularly when contrasted with the sleek stainless steel of the case and bracelet. On the left side of the 42mm case is a plate with an engraved ‘Bentley’ inscription, which was inspired by the dashboard of the historic 1929 ‘Blower’ Bentley. The Breitling Manufacture Calibre 01 is a mechanical movement that has proven time and time again to be reliable and accurate. The transparent caseback is engraved with ‘1 of 1000’. Known for innovative designs and high-tech elements, TAG Heuer has been pushing boundaries for many years. The Swiss luxury brand was founded in 1860 by Edouard Heuer in Saint-Imier as Uhrenmanufaktur Heuer AG and, in 1985, it changed to TAG Heuer after the TAG Group acquired a majority stake in the business. TAG stands for ‘Techniques d’Avant Garde’, which perfectly represent what the brand is about. The watchmaker has been true to its motto of ‘Don’t Crack Under the Pressure’ by creating timepieces designed for worldwide sporting events such as Formula One. Durable, accurate and stylish, TAG Heuer is made for the modern gent or lady who love life in the fast lane. Another big announcement made at Baselworld 2019 was the new TAG Heuer Autavia Isograph collection, which we are very excited about. The collection was originally conceptualised as motorsport and aviation watches, with even its name being a contraction of two words: Auto and Aviation. The new line is more focused on the aviation side, featuring a three-hand direction and Arabic numerals. The bi-directional 60-minute bezel, oversized crown and large sword-shaped hands are ideal for visibility in the cockpit. The ‘isograph’ refers to the carbon composite hairspring that TAG Heuer used in the Calibre 5 movement. 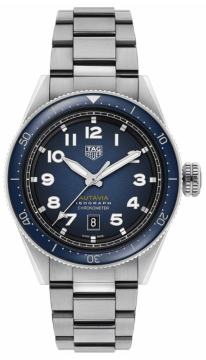 The TAG Heuer Autavia Isograph Automatic watch is a great example of how well the 1933 collection has been re-imagined. Bold, contemporary and stylish, this watch comes with a stainless steel bracelet and blue dial, as well as an additional NATO strap and a smooth 42mm stainless-steel case which offers a beautiful contrast to the dial. A watch that is suited for life in the outdoors, especially when you take into consideration its water resistance of up to 100 metres, sturdy self-winding automatic COSC-certified chronometer and scratch-resistant sapphire crystal. The first Hublot watch was created in 1976 when Carlo Crocco founded his own manufacturing company called MDM Genève; it took him three years to create the Hublot, which means ‘porthole’ in French, with the first natural rubber bracelet in haute horlogerie. In 1980, the watch was debuted at Baselworld and quickly became a commercial success. The brand has been synonymous with innovation, precision and high-tech manufacturing since then. Hublot have also developed their in-house chronograph movement, the Unico, which required several years of research and is regarded as a truly outstanding mechanical movement. The impressive partnerships Hublot has cemented include those in the motorsports industry (such as Ferrari) and in football (like FIFA and Juventus). A brand-new creation that Hublot revealed at Baselworld was the Classic Fusion Orlinski collection. The line is sculpted in the aesthetic signature of artist Richard Orlinski, including the faceted dial. 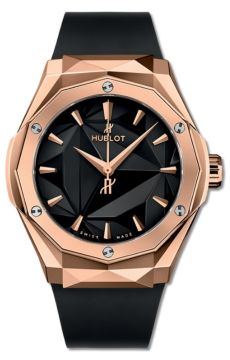 Combining flair with performance, the Hublot Classic Fusion Orlinski King Gold watch is perfect for anyone who wants to make a statement but is still conscious of style. The bold 40mm polished 18ct rose gold case houses a HUB1100 self-winding movement – protected by sapphire crystal – with a power reserve of 42 hours. The watch also comes with a black rubber strap that is comfortable on the wrist. The beautiful contrast of the black with the gold accents, as well as the superb high performance and precision, make this watch a one-of-a-kind piece. The Swiss luxury watchmaker was founded by Auguste Agassiz in 1832 in Saint-Imier. The company has been a subsidiary of the Swiss Swatch group since 1983 and its logo, the famous winged hourglass (registered in 1889), is the oldest unchanged in the world. Their motto ‘Elegance is an Attitude’ is represented in each timepiece Longines creates, as well as in their ambassadors, who include Kate Winslet, Albert Einstein, Humphrey Bogart, Audrey Hepburn and Simon Baker. Longines developed their first chronograph movement in 1878 and, since then, they have been building relationships with the best and brightest in several sporting industries. From horse racing to archery and skiing, the Swiss brand is the official timekeeper of many organisations around the world. 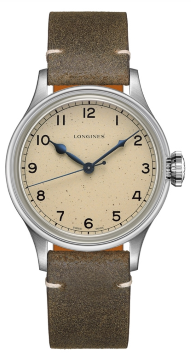 Heritage is incredibly important for Longines as well, which is evident in their release of the Heritage Military watch. This timepiece embodies elegance in an effortless manner, combining a timeless appeal with cutting-edge watchmaking technology. Longines aim to pay tribute to history through refined and sophisticated watches, and the Longines Heritage Military Watch is no exception. This piece is also unique. The dial, which features beautiful blue hands, has been sprayed by hand with tiny black droplets, meaning no watch is the same. You receive an extra NATO strap and a Longines branded strap fitting tool upon purchase. The model is powered by a self-winding mechanical movement beating at 25’200 vibrations per hour and offering 64 hours of power reserve. The stainless-steel case and the sapphire crystal only add to this piece’s durability and longevity, making it a watch for life. Known for their innovative use of materials, particularly ceramics, Rado were founded in 1917 by three brothers and launched their first scratch-resistant model in 1962, the world-renowned DiaStar. The Swiss luxury watchmaking company specialises in high-tech materials and leading-edge technologies and have been winning international design awards for their choice of aesthetics for many years. In 1990, the company launched the Rado Ceramica, the first timepiece in which the bracelet and the case were made of durable ceramic; this technological advancement has allowed Rado to stand out from other brands in the horological industry. 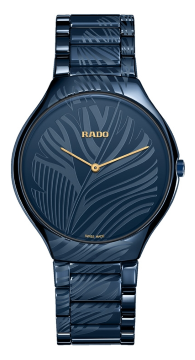 We’ve discussed this brand more in detail in our “Rado: Swiss Sophistication and Cutting-Edge Innovation” article. The brand’s ultra-thin ceramic masterpiece, dubbed the True Thinline collection, was launched in 2011; the models in this line only measure at 5mm in width, something unique in luxury watchmaking. Baselworld saw a new addition to this stunning collection, which we can’t get enough of. Limited to 1,001 pieces, the Rado True Thinline My Bird watch is a deep blue high-tech ceramic piece that is both a fashion statement and a high-performance model. In addition to the ceramic, the sapphire crystal further ensures this watch is durable and long-lasting, perfect for everyday wear. Be it the boardroom or an evening out with friends, the Rado True Thinline My Bird is perfect for any occasion. It comes with a 39mm ceramic case and water resistance of up to 30 metres as well, and its beautiful patterns are, simultaneously, striking and understated. This year’s Baselworld was, once more, a showstopper when it came to luxury watches and world-class brands. You can browse more new watches and Baselworld 2019 releases by browsing the Banks Lyon website or, alternatively, feel free to visit us at our Lancaster or Kendal store to see them in person.